Sides – GOOD food from the good life . . .
Wild Garlic season is upon us ! Where I live, you are sure to find fields of beautiful fresh wild garlic from early spring. Pesto is pretty forgiving stuff, so play around with the ingredients to adapt to your taste and what you have on hand. I used a few cashews and a few more almonds this time. 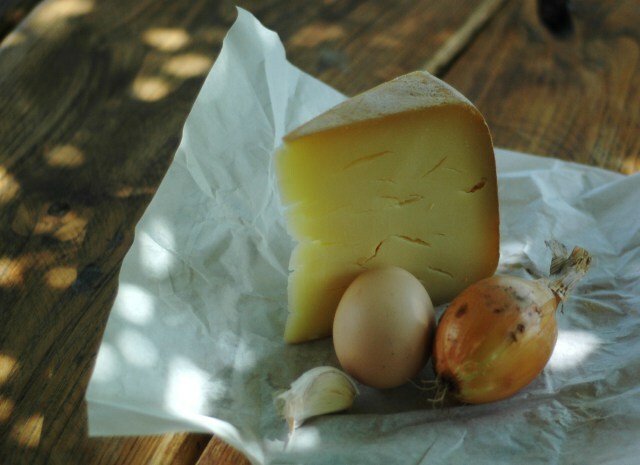 Strong Ewe’s milk cheese gave it a wonderful flavour. Use more or less olive oil depending on what you will use the pesto for (for pasta it should be runnier). This made enough for one meal of pesto on roast chicken and potatoes and tossed through pasta the next day. Everything goes in a food processor or herb chopper (use a blender for a smoother finish, I like mine chunky) and give it a whizz until you have the texture you are looking for. Store any leftovers in a jar, covering the pesto with oil, in the fridge. I could live off Dal (I think quite alot of people do in India ! )… Isn’t it wonderful when “healthy” also falls under the heading of “comfort food” ? Dal (daal, dhal etc.) is a broad term that refers to legumes (lentils, peas, and beans) that are cooked and spiced. I’m sure there are an infinite number of recipes for Dal though one of its endearing qualities is the lack of need for a recipe. Get the water to lentil ratio about right and play with it from there. One of my favourites is this base, made with red (actually orange, go figure ;)) lentils. PS : red lentils are a great source of iron …. The most exciting bit of this dish lies just before serving. . . TEMPERED OIL. Once you try tempering spices in oil, you’ll be flavouring all of your curries this way…. Put the lentils into a large saucepan with the turmeric, salt and water. Bring to a boil and skim the foam that rises. Simmer, covered on a low heat until the lentils are soft, 20 minutes or so. Add more water if necessary and taste for salt. Some like their Dal thick some like it soupy, its up to you. For the tempering oil, combine the oil, coriander seeds and the cumin seeds in a small pan and heat over a moderate heat, stirring until they colour slightly (1 minute). Add the chilies and cook, stirring for another 30 seconds. CAREFUL NOT TO BURN THE SPICES. Pour the oil and spices into the Dal, add the lemon or lime juice if using and simmer for another 5 minutes before serving. Serve on its own, with rice or Naan bread, or as part of a curry feast. Before adding the lentils, fry a grated onion until soft adding chopped ginger and garlic just before the lentils and water go in. Add a chopped fresh tomato just before the lentils are done. Replace half the water with coconut milk. Top with fresh coriander (cilantro). Top the dish with crispy fried onions or leeks just before serving. The moment when summer meets autumn and the fruit and veg available start to change. Before “the change” goes too far I like to pair the taste of summer and autumn together. This is a delicious recipe to eat as a side dish or mixed with pasta. Just cooked green beans, a bit of pig for the salty richness, toasted hazelnuts for a bit of crunch and some very good quality “raw” crème fraiche from gorgeous local Jersey cows to blend it all together. Although it has been, in general, a pretty bad year for veggie gardens in southwest France this year, the green were as prolific as usual. 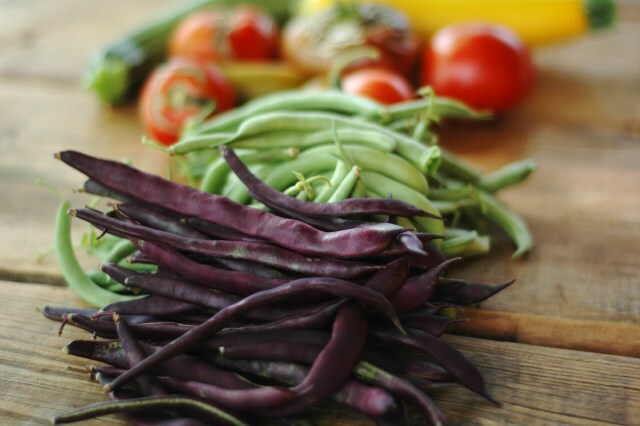 This year I grew your basic French green bean, gorgeous purple ones and very long Chinese red beans (just for fun). Bring a large pan of salted water to the boil and cook the beans for 4-5 mins until cooked, but still vibrant. Drain the beans and tip straight into a bowl of ice-cold water. Drain again and set aside. Heat a frying pan, tip in the bacon and sizzle for 4-5 mins until it starts to crisp. Use a slotted spoon to scoop out the bacon, but leave behind any juices and residue. Place the pan back on a low heat, slosh in the vinegar and sizzle for a moment, then stir in the cream. Return the beans, bacon and hazelnuts to the pan to warm through and toss them in the dressing. Tip into a bowl and mix in the tarragon just before serving. ** To easily peel hazelnuts: Dry toast them in a frying pan, being careful not to burn ! Tip them onto a clean tea towel and wrap them up. Once cool rub them around in the tea towel which will help remove most of the papery skins. With the late August heat, this has re-emerged as a “test” in the solar oven. Great results with a beautiful crispy top . . .
Its late August and the garden is in overdrive ! We are now on our 8th continuous week of eating green (or purple 😉 ) beans numerous times per week… I usually make this recipe at least once in the season when I want to “get rid” of loads of beans in one meal. Its an interesting recipe as it seems a bit odd, on the verge of “will this work?”. The ratio of beans to the other ingredients just doesn’t seem right. Trust me as I trusted the original recipe, it does work.